Federal autocat recycling specializes in metal substrate recycling, the difficult extraction of PGM values from metal substrate or 'foil' catalyst elements, using proprietary and environmentally friendly technology. Metal substrate recycling is key in returning top values to our customers. 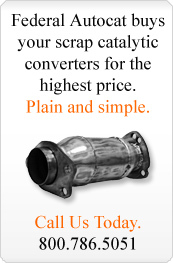 Federal Autocat Recycling has proprietary technology that allows us to provide significant returns for those catalysts with greater density of platinum and other precious metals, especially those found in foil or "wire" catalytic converters. With over 75 years of cumulative experience in the recycling of PGMs, Federal Autocat Recycling will evaluate your catalyst material rapidly and return cash for your scrap. Contact us to learn more about our metal substrate recycling program.